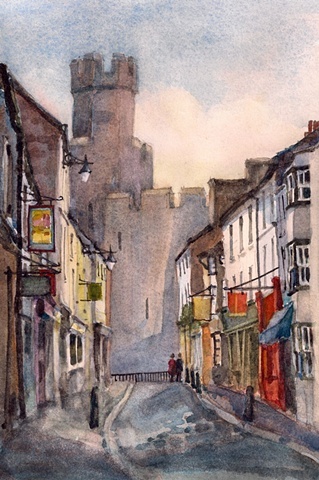 Vyvyan Green Watercolours - Caernarfon Castle, Wales. Recently, we stayed at a B & B just around the corner from here. This painting from a photo I took just as it was getting light. I really enjoyed my trip to Wales with my sisters and brothers-in-law. I should like to go back to Wales again......... if I can get a ride from my sister. I'm not allowed to discuss publicly anything concerning my sister's driving.